Representative Honours: Northern Ireland: Full, 17 Under-21 caps / 4 goals, 6 Under-19 Caps / 1 goal, 2 Under-17 Caps. 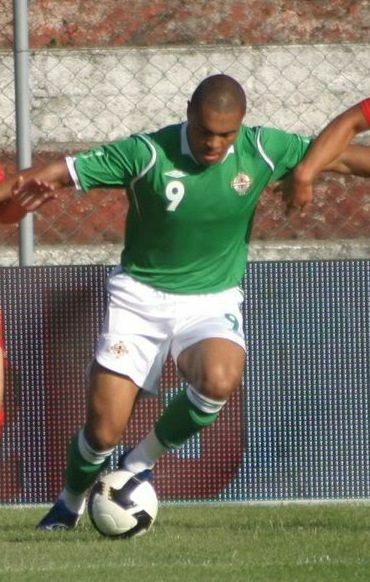 Josh Magennis claimed Northern Ireland Under-17 caps as a goalkeeper and featured on the bench for Cardiff before being converted to a forward. He made a handful of outfield appearances for the Bluebirds, earning a place in the Northern Ireland squad that traveled to the USA and Chile in the summer of 2010. On his return from international duty, Magennis was released by Cardiff. He joined Aberdeen, but endured a difficult first season at Pittodrie and it seemed likely that he would again be released until Craig Brown decided to give him a run in the team at full-back late in the 2011/12 season. He remained with Aberdeen until 2014, earning a reputation as something of a jack-of-all-trades. For Northern Ireland he continued as a regular squad member, coming off the bench to add a bit of muscle in whatever position was required. A 2014 move to Kilmarnock saw Magennis enjoy a sustained run in attack for the first time in his career, though he struggled to find the net on a regular basis, dividing opinion among fans. For Northern Ireland's successful Euro 2016 qualification campaign Michael O'Neill installed him as first choice back-up to Kyle Lafferty and he became a regular feature as a second-half substitute, with his presence notably aiding Northern Ireland to a late win over the Faroe Islands and an even later equaliser against Hungary in September 2015. The following month, with Kyle Lafferty suspended for the key qualifying match against Greece, Magennis started his first competitive match. His looping header that put Northern Ireland 2-0 up early in the second-half was greeted by emotional celebrations, essentially sealing the team's place in France and answering the critics who had questioned Magennis' place in the team. 2015/16 saw Magennis enjoy his best season in front of goal as he scored thirteen times for a struggling Kilmarnock side that only avoided relegation from the Premiership with a play-off victory over Falkirk. He traveled to Euro 2016 with the emergence of Conor Washington and the club-form of Will Grigg putting his position as first-choice back-up under threat. Magennis need not have worried as his unique attributes continued to be recognised as useful by Michael O'Neill. Early in the 2016/17 season Magennis was the subject of several bids from English League One side Charlton and eventually a £250,000 fee was agreed. Pictures courtesy of Roy Cathcart.